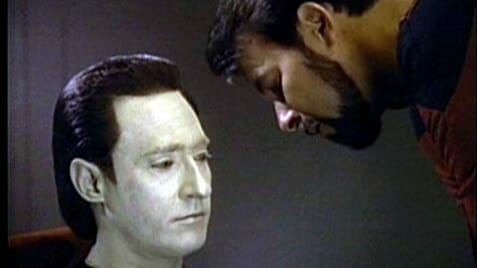 When Data resigns his commission rather than be dismantled for examination by an inadequately skilled scientist, a formal hearing is convened to determine whether Data is considered property without rights or is a sentient being. Captain Phillipa Louvois: I can use serving officers as legal counsel. You, as the senior officer, would defend. Captain Phillipa Louvois: And the unenviable task of prosecuting this case would fall on you, Commander, as the next most senior officer of the defendant's ship. Commander William T. Riker: I can't. I won't. Data's my comrade. We have served together. I not only respect him, I consider him my friend. Captain Phillipa Louvois: When people of good conscience have an honest dispute, we must still sometimes resort to this kind of adversarial system. In this episode, whether Data is a sentient being or merely property of Starfleet is determined, to see whether he has the free will to reject the request of unskilled cyberneticist Bruce Maddox to disassemble him. Initially, JAG captain Phillipa Louvois rules summarily in favor of Maddox, so Picard requests a hearing. Louvois initially says "Data is a toaster", indicating that toasters are still popular in the 24th century and thus that toast can't be replicated. One does wonder about the consequences to the Federation's supposedly superior morals if Data is property. We previously learned in "Datalore" that Data had been found on Omicron Theta by Starfleet officers and so if he's only property, Starfleet would be guilty of the theft of Dr. Sung's property. Still, this is the best episode of season 2. It's what Star Trek is supposed to be about, an exploration of what constitutes a person, even if it does ignore some legal questions. The worst part here is Dr. Pulaski, as cynical and culturally insensitive as always.